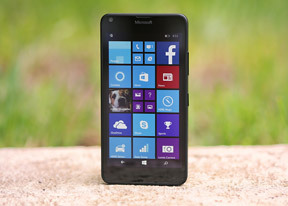 The Nokia Lumia 640 has a 5" LCD screen with 720 x 1,280px resolution. That works out to 297ppi, which doesn't exactly qualify for Retina grade (300+ppi), but it's quite close nonetheless. The Lumia 640 screen renders text and images smoothly. Text is not flagship sharp, but even small or thin fonts are readable, lacking the jaggies visible on older 5 and 6-series Lumia phones. This is an IPS screen so the viewing angles are quite good with no color shifting, but the colors themselves are a bit dull. Luckily, you can go into the screen settings and adjust both the brightness (low/mid/high tones) and the color temperature and saturation. 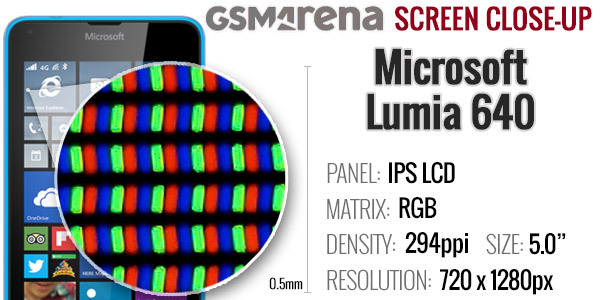 The screen is brighter than similarly priced Androids and the black levels have improved since the Lumia 630, making for 1,000:1 contrast ratio. The screen performs almost identically to that of the higher-end Lumia 830, the bigger Lumia 640 XL was even more impressive. The screen features what used to be Nokia's ClearBlack tech - a polarization filter that's used to reduced glare (something like how polarized sunglasses work). The lower brightness means the screen isn't as readable as that of the 640 XL, but the ClearBlack filter makes it almost as legible as an Xperia Z3 screen or that of the original HTC One. We mentioned in the nitro that the "Lumia 640" really is an umbrella name for three devices. There's optional LTE and optional dual-SIM, you can have both but you can't turn down both. That is there's no single-SIM, non-LTE version. The Lumia 640 XL has such a version, the only reason we can think of why Microsoft would skip this one is that pricing would clash with the Lumia 5xx phones. Anyway, the Microsoft Lumia 640 has 150Mbps/50Mbps LTE and 42Mbps/5.76Mbps 3G HSPA+. If you get the base model you won't have LTE, but 3G is still fast enough. The multitude of connectivity versions points to Microsoft's ambitions. The 640s are headed to countries that are yet to roll out 4G networks, but pricy carrier plans make the second-SIM a cost-saving measure. The single-SIM LTE model is for markets with LTE coverage - a capable, affordable phone. Finally, the dual-SIM LTE is for those who just want to check all the boxes. The rest of the story is pretty familiar. Wi-Fi supports b/g/n networks, dual-band would have been appreciated but is almost entirely missing from this price segment. Bluetooth version 4.0 with A2DP is supported and there's NFC too. For positioning, the Lumia 640 calls on GPS, GLONASS and Beidou. It also has a built-in compass. FM radio is on board, a nice alternative source of news and music that many Androids have been dropping recently in favor of its online streaming alternative. Some 5" phones think they can get away with 2,000mAh batteries, but the Microsoft Lumia 640 knows better. At 2,500mAh it has as much juice as a Galaxy S6 and the results speak for themselves - you can go through three days of moderate usage before you need a charger. The web browsing and video playback times, both at nearly 10 hours, were particularly impressive. We've seen plenty of phones run out of steam hours sooner, both affordable phones and flagships. 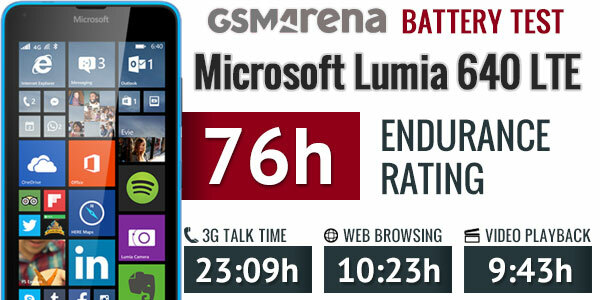 The talk time is lower than on the Lumia 640 XL but you won't run into problems even if you're on the phone all day. Note that we tested the LTE-enabled, single-SIM version. However, the Lumia 640 XL Dual SIM showed no noticeable difference in standby power draw with one or two SIM cards.